Argh! I spent all day yesterday doing a whole host of Admin things and in between I played with the japanese stab binding patterns I posted about a while back. 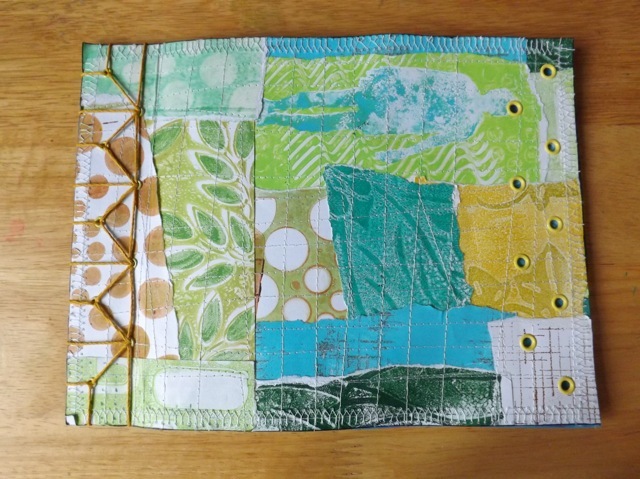 I wanted to finally finish up the book from Gelli prints with the sewn paper scraps “fabric” I also showed. I tried out so many of the patterns, with the focus of working out, if possible, a two-colour version. None of them I was happy with in the end, and after looking at the cover on my desk for most of the day, I decided a simpler traditional pattern would actually compliment the cover better than a super decorative one, which might distract. I have to say I still love ALL of the patterns and want to use them ALL. 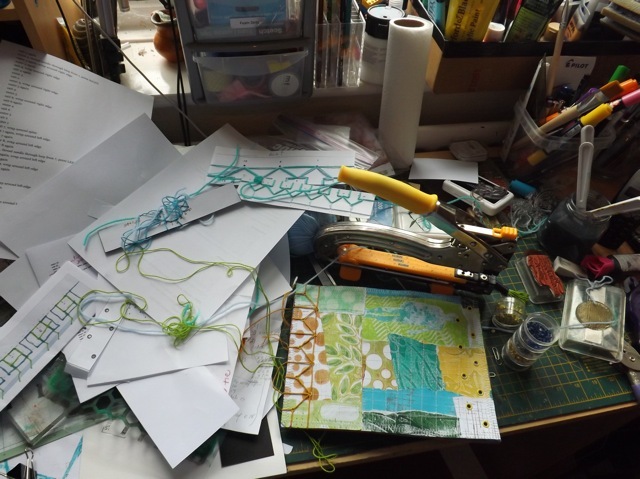 And her instructions are superb – I had to research the pattern I decided on and write it up in the Enter/Exit style for myself so I was sure I would get it right the first time. See my screens? Bad enough, the little area in front of my monitors, not to mention the chaos on the screen, but OMG my proper desk…. You can see all (no, really only SOME) of my practice pieces and printed instructions. and I love how the eyelets that echo the stitch holes let the contrasting first page show thru to the cover. Now, having shown the shame of my desk, I hope to get it all tidy for WOYWW. As my parents have had same pretty bad weather there in Northern Virginia (lots of ice and snow) and lost power, I’ve been without email for a day (our email server resides in their basement) so much of what I should be doing I can’t so till their power come back on. So cleaning is the order of the day! 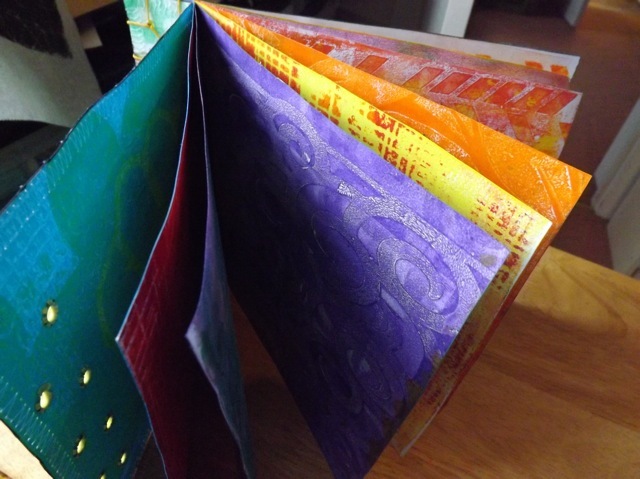 Categories: Gelli plate monoprints, handmade books | Tags: Gelli, Gelli plate, handmade books | Permalink.